It's been a while since I posted about the reno(vation... everyone seems to think that reno means Reno, as in Nevada... ??? maybe it's a Canadian thing to call it a reno? Anyway, get your mind out of the southwest US and back to MY PROBLEMS, k?). We got the floors dried up-- took an extra day or 2, but we did get back to acceptable levels (which is 12-16% humidity, btw, and not 100%. Just sayin') and the emergency folks took their giant fans and dehumidifier away sometime in the first week of July. Over the next few weeks, I just fretted, and planned how to run a makeshift kitchen with a microwave, an electric kettle, and a bathroom. Paper plates folks, that's how. (biodegradeable, of course. We are yuppie scum after all). We also finalized things and bought things, like the range hood, the pendant lights (pics when those come out of hiding in the garage), the floors, and the paint colors. Last week, we had professional movers come in (see pics) to pack the GIANT china cabinet, and the TON of kitchen stuff, as well as move said giant cabinet to the garage, all wrapped up tight, and the other things to the basement. Packing the kitchen... soooo much stuff! But they said I'm nowhere near a hoarder, so don't go calling A&E! Boxes of stuff. George Carlin was right. Say goodbye to the couch! We will miss you, napping-couch-of-happiness-North. Also say goodbye to the beige, dark green, and dark purple! These are the strand bamboo floors we've chosen. Color is Qing Viper. These are the paint colors we've chosen. From the left: Popular Grey for the living room and any walls in the kitchen. Proper Grey for the powder room. Great Green for the dining room. Tanbark for the hallways downstairs and upstairs. I paid a little extra, and the movers took away, permanently, our old couch, and some other things that were cluttering the basement. So even MORE room for storage. Joy. 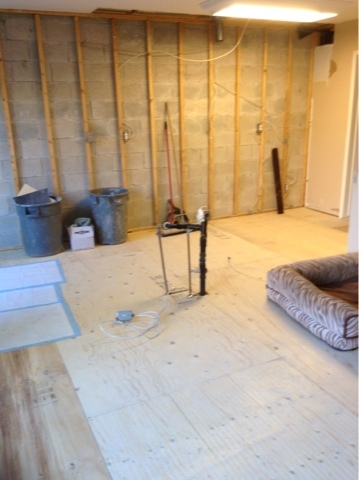 Today, the reno started for reals, yo. Empty bin, 8am on Day 1. 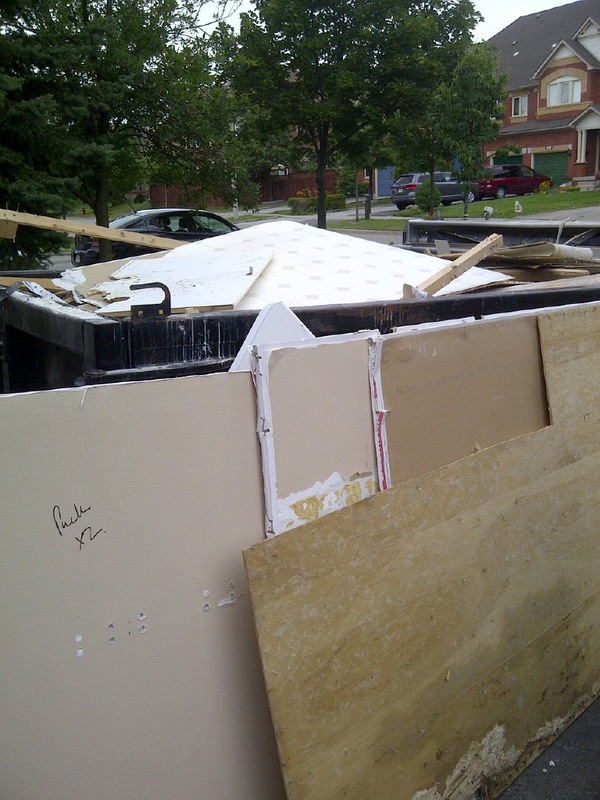 Before 8am, the smallish bin arrived in the driveway. Apparently, it will leave tonight (maybe no need for a parking permit for me, for the street?) and it will reappear when the guys feel it's necessary. Just after 8am, Adam and Josh showed up and after a brief tour, started the demolition. Around 10am, Rob, the electrician, came by for a surprise but welcome visit. He was in the neighborhood, but is scheduled officially for tomorrow. We were able to do a bit of a walk through, and no issues arose until we discussed putting lighting in the ceiling of the dining room, which doesn't have any. Before you ask-- I'm opposed to sconces. I like my wall options flexible, so no sconces. Because we have the dreaded popcorn ceilings, running lines from the plugs will be an issue (they have to cut the ceiling, and you can't really, easily, patch the popcorn). Options are to scrape the popcorn ($$$) or run the lines up inside the walls, pop out at the top, and use crown molding to cover it ($). So, that's what we'll do. Can you say, scope change? Around the same time, the company owners, Joe and Justin, came by as well (so everyone but plumbing was here, woo!) and we ran down the electrical options again, and then Rob left, and Joe, Justin, and I talked a bit more. They left, and I left shortly after to get the last of my water-damaged dining room chairs (that were in the basement when it was RAINING through the floor) to the refinisher. The demo proceeded VERY quickly, and by 11:30, the last of the floor and wall was in the dumpster bin. All cabinets and appliances, gone. This is the wall that will change the most. They guys went for lunch, and to pick up the 3/8th inch plywood that they will install, to go under our new bamboo floors. Dustapalooza, Day 1. 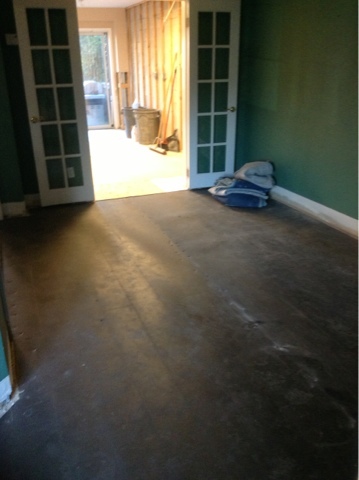 Say goodbye to these floors anyway! So here we are at the end of Day 1, and feeling pretty good about it. They took up the laminate, but left the under pad, and cleaned the floors really well, so Haka wouldn't hurt himself during the night. 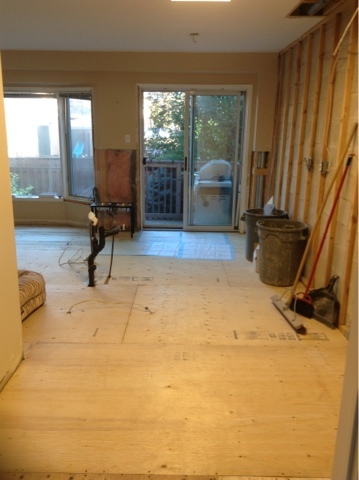 End of the day - all the laminate is gone. And the dust too! I think the floors are cleaner than they've been in a month! I may go visit my cabinets tomorrow-- apparently, ATD likes to receive and assemble them at their facility, and then bring them to the site pre-assembled. On tap for Day 2: demo should be finished, electric will start, they should finish demo on the floors, and maybe they'll start rebuilding the walls. And, I'm going to make "Birchermuesli" in my makeshift kitchen. Stay tuned! When you don't have a kitchen, what happens at breakfast or when you're gagging for a cup of tea?